This is a list of links and summaries of media in Columbia and Boone County. Black history coverage is listed below and on its own page Black History Media coverage. April 7, 2019 — New trail to open in celebration of Columbia’s black history. Source: KOMU.com. Summary: An African-American Heritage Trail with 21 historic markers was approved by Columbia’s City Council on April 1. 2019. The 2-mile trail will include 30 sites including Sharp End. April 5, 2019 — Three notable figures inducted into Historical Society’s Hall of Fame. Source: Columbia Missourian. Summary: Those named were Mills Menser, owner of Buchroeders Jewelers, Ann Covington, retired chief justice of the Missouri Supreme Court and the late Don Faurot, MU football coach and athletic director. April 3, 2019 — The park is slated for bicentennial expansion. Source: ABC17News.com. Summary: The plan for the park expansion designed to mark the May 2021 CoMo200 bicentennial was approved by The Downtown Leadership Council. The plan will go for approval to the Columbia City Council on May 6, 2019. April 2, 2019 — Route for African-American Heritage Trail approved, will add more historical markers. Source: Columbia Missourian. Summary: A walking trail marking African-American history was OK’d by Columbia City Council on Monday, April 1, 2019. The two-mile trail follows city sidewalks, part of the MKT trail and a portion of Columbia Cemetery. The trail has eight markers now with another 13 to go. African American Heritage Trail route. Source: Columbia Missourian. March 19, 2019 — University of Missouri police officer fired for blackface photo. Source: Columbia Daily Tribune. Summary: MU police officer Marcus Collins fired for wearing blackface in a photo provided by an anonymous source. Race Matters, Friends lauds MU firing the employee for racism. March 21, 2019 — State Historial Society prepares for move. Source: Columbia Tribune. Summary: The Columbia Research Center of the State Historical Society of Missouri will close on April 19, 2019, until the new center opens Aug. 12. Feb. 24, 2019 — Columbia College hosts second-annual Black Business Expo. Source: Columbia Missourian. Photo gallery of Black Business Expo held at Columbia College. Feb. 23, 2019 — Second annual Black Expo fosters business relationships. Source: Columbia Missourian. Summary: Black Expo included business from across mid-Missouri as well as St. Louis and Kansas City. Feb. 23, 2019 — Mid-Missouri black entrepreneurs showcase their businesses Source: KOMU. Summary: Columbia College held a Black Business Expo on Feb. 23 featuring more than 30 black-owned businesses. Feb. 19, 2019 — Missouri Bicentennial Celebration needs you. Source: Columbia Daily Tribune, but written by Wes Franklin who writes for the Neosho Daily News. Summary: How to get involved in the state’s Missouri 2021 bicentennial celebrations. Feb. 12, 2019 — Have a piece of Boone County you love? It could be memorialized in a mural. Source: Columbia Missourian. Summary: Stacy Self, a local artist, is collecting input for a mural planned to mark the bicentennial of Boone County, Missouri. An event will be held at 9 a.m. Saturday, Feb. 16 in the Southern Boone County Public Library. The mural will be displayed at the Boone County History and Culture Center after 2020. Feb. 1, 2019 — Public offers feedback on Flat Branch Park expansion. Source: Columbia Missourian. See a pdf of a rendition of the planned expansion here. Dozens of residents attended a meeting where Deb Sheals of the CoMo200 taskforce and Mike Snyder of Columbia Parks and Rec Dept. presented a plan for a park expansion to mark Columbia’s bicentennial in 2021. Plans include landscaping, a bridge, improved lighting, sculptures, a donor wall and reinstalling brick pavement on Fourth Street. The article included comments from Mark Stevenson, owner of the property on the east side of the proposed park expansion. He’s concerned about losing parking. Another comment by Robbie Price, an architect with Simon Oswald Architecture, noted concern about the bridge meeting Americans with Disability Act requirements. Nov. 28, 2018 — The CoMo Makes Plan: Business Loop. Source: Columbia Business Times. Summary: Plans to develop the Business Loop now called The Loop into a small-scale artisan manufacturing sector. The article quotes Carrie Gartner, executive director of The Loop, and outlines future plans. Those plans include a site visit from a “grant-funded consulting services” firm Smart Growth. There is also a website called COMO Makes that will list artisans and firms that provide resources for artisans. It is already open for artisans and support firms to register. Nov. 28, 2018 — The Drive to Improve: 3M. Source: Columbia Business Times. Summary: History of 3M since its opening in Columbia in 1970 and a look toward future plans. Quotes new plant manager Jim Burkhardt. The article states that 3M was once one of Columbia’s largest employers. Nov. 28, 2018 — What happens now: Sewer debate. Source: Columbia Business Times. Summary: A history of the Henderson Branch sewer project and the Midway USA and Midway Truck and Travel Plaza development. The article includes information from former city manager Bill Watkins, John Glascock, David Nivens, Ian Thomas and David Sorrell. Nov. 18, 2018 — The Sit-in at the Minute Inn: A Columbia native and the civil rights protest that shaped him. Source: Vox magazine, written by Lauren Puckett, images by Jason Vance. Summary: Jim Nunnelly looks back on the sit-in in 1960 in Columbia’s Minute Inn. Prior to this civil rights push, African Americans were not allowed to sit down inside the Minute Inn restaurant. Nunnelly was thrown out of the restaurant by owner Hubert Odell Blakemore. Today, the Minute Inn has changed ownership and become the Broadway Diner. The article includes a civil rights timeline. Nov. 11, 2018 — Community members remember Smithton on march to bicentennial. Source: KOMU.com. This piece includes comments from Richard Mendenhall, who portrays Robert S. Barr, one of the early founders of Smithton, which later moved to a water source and changed the settlement’s name to Columbia. Nov. 8, 2018 — Before Columbia there was Smithton. This year, the settlement turns 200. Summary: Smithton, the predecessor to Columbia, was founded in 1818. This article announces the Nov. 11, 2018 event to celebrate Smithton/Columbia’s bicentennial. Oct. 23, 2018 — MU recognizes civil rights trailblazers at residence hall dedication. Source: KBIA. Summary: MU named a residence hall after African American trailblazers George C. Brooks and Lucile Bluford and atrium for Gus T. Ridgel. Bluford was denied admission to MU’s School of Journalism graduate program in the 1940s. She was awarded an honorary doctorate in 1989. Brooks was MU’s first African American administrator; he was the financial aid director for 17 years. Ridgel was the first African-American student at MU to earn a graduate degree. Oct. 19, 2018 — Photo Gallery: MU dedicates Bluford Hall. Source: Columbia Missourian. Photo coverage of the dedication of the MU buildings for African Americans Lucile Bluford, George C. Brooks and Gus T. Ridgel. Sept. 19, 2018 — Fourth and fifth markers commemorating Columbia African-American history unveiled. Source: Columbia Missourian, written by Clare Roth. Summary: The Sharp End Heritage Committee dedicated two more markers on the African American Heritage Trail. One of the markers lauds the place where the home of Annie Fisher once stood at Seventh Street and Park Avenue. Fisher was born to enslaved parents and went on to fame from her restaurant and cooking. According to an Aug. 24, 2017 Vox magazine article, she made a fortune of about $100,000. According to measuringworth.com, a wealth calculating website, that amount would be valued at $2.4 million to $94 million dollars in 2017. Another marker noted the Douglass Pool and the original Russell Chapel. The chapel was destroyed during the 1950s as part of the Douglass School Urban Renewal project. First Ward City Councilman Clyde Ruffin spoke to the crowd of roughly 30 people. July 26, 2018 — History of protests in 2015 offers lessons in school leadership. Source: Columbia Missourian, written by Kathryn Palmer. Summary: An analysis of the protests of 2015 by Ben Trachtenberg states that it wasn’t the demands or level of racism that caused the protests but leadership deficiencies. The demands of the black student activists included noting racial discrimination and correcting it, an increase in black faculty, increased minority student retention. The group that headed up the protests called themselves Concerned Student 1950, a name that referenced the year MU was integrated. July 25, 2018 — From 1888 to 2018 on Sanborn Field. Source: Columbia Missourian. Outlines the contributions to science and the University of Missouri made from the agricultural research field known as Sanborn Field. It includes the fact that a soil sample taken in 1945 is in the Smithsonian Institute. The soil was used to develop an antibiotic similar to penicillin. July 24, 2018 — Three years after protests, educators plant seeds for ‘black history renaissance’ at MU. Source: Columbia Missourian. Summary: The new MU Carter Center for K-12 Black History is dedicated to three goals: “To conduct research on black history education; To evaluate and enhance K-12 black history instruction with teachers; To design K-12 black history curriculum for teachers and districts,” the article written by Kathryn Palmer states. July 17, 2018 — Council approves new East Campus neighborhood association. Source: Columbia Missourian. Summary: City Council voted to recognized a new neighborhood association for the East Campus area. The new association is the East Campus Traditional Neighborhood Association, made up mainly of landlords. The older organization, the East Campus Neighborhood Association is an older organization made up mainly of homeowners, according to the article. July 16, 2018 — Unsafe pin oaks come down on the MU quad, Columbia Missourian. Summary: Five pin oaks are being removed. The clay soil of MU’s Frances Quadrangle limited their lifespan. July 16, 2018 — Pin oak tree removal will begin on historic Francis Quadrangle this week. Source: MU News Bureau. Summary: Five, 60-year-old pin oaks will be removed. Replacing the trees will be funded by “The Legacy Oaks of the Francis Quadrangle.” The trees will be replaced with native white oaks. July 16, 2018 — MU starts removal of aging oaks from Francis Quadrangle. Source: The Columbia Daily Tribune. Summary: “Age, soil conditions and overwatering have taken a toll,” on the oaks, according to this article. June 13, 2018 — Columbia, Boone County working on distinct bicentennial celebrations, Columbia Daily Tribune. Summary: The city of Columbia and Boone County will hold their own events to celebrate the 200th anniversary of their founding. July 12, 2018 — Hunt Avenue adapts to the times. Source: The Columbia Missourian. Summary: Houses on Hunt Avenue are going to be demolished so the owner Fred Christman can redevelop the area. The houses are too small for today’s standard, less than 1,000 feet. The houses are also older and built in the 1940s and 1950s. Hunt Avenue is north of Worley and south of I70. May 30, 2018 — Historic home may be razed, Columbia Missourian. Summary: A house at 1506 Hinkson Ave. in the Benton-Stephens neighborhood burned on May 10. The house may now be razed. The house is owned by Emmett McNulty. The house was built around 1925. Here‘s what it looked like before the fire, according to this page on Realtor.com. May 28, 2018 — Columbia Cemetery comes alive for Memorial Day, KOMU.com. Summary: Re-enactors at Columbia’s oldest cemetery portrayed historical figures buried there including James L. Stephens, Victor Barth, Richard Henry Jesse, Mary Paxton Keeley, John Lange Sr., Robert Beverly Price and Brig. Gen. Oden Guitar. The event was sponsored by the Friends of the Historic Columbia Cemetery. May 28, 2018 — Columbia residents learn when History Comes Alive, Columbia Missourian. Summary: Hundreds attended the second annual History Comes Alive event at the Columbia Cemetery. May 10, 2018 — Artifacts, history preserved. Source: Columbia Missourian. Summary: Items removed from the now-demolished James Condominiums at 121 S. Tenth St. and the Bull Pen Cafe, once at Business Loop 70, are being used in the cafe DrinKraft of Josh Wexler. May 10, 2018 — House fire on Hinkson Avenue ruled suspicious, ABC 17 television news. Summary: The house at 1506 Hinkson Ave. was ruled suspicious. May 10, 2018 — Fire deemed suspicious, Columbia Tribune. A house fire at 1506 Hinkson Avenue. Here‘s what it looked like before the fire, according to this page on Realtor.com. May 10, 2018 — Suspicious fire took nine fire department units to be extinguished, Columbia Missourian. House fire at 1506 Hinkson Avenue. May 9, 2018 — Architectural artifacts find their way into businesses, homes, Columbia Missourian. Summary: Josh Wexler is opening DrinKraft on Tenth and Park Avenue and will be decorating with items reclaimed from now demolished buildings. He is using items from the now demolished Bull Pen Cafe and the James Apartment at 121 S. Tenth St. Susan Maze is using items from the James Apartment in her home. She was a former resident of the James Apartment. Pat Fowler, chair of the City of Columbia’s Historic Preservation Commission, commented about the items being reused and the auction the city holds to sell items saved from buildings set to be demolished. March 8, 2018 — Celebrating two centuries worth of Columbia history: From the city’s first years, to its 200th year, Columbia’s birthday is commemorated with some historic highlights, Vox magazine, Columbia Missourian. Summary: Snippets of information with a timeline showing highlights of Columbia’s history. Feb. 6-7, 2018 — On Tuesday, Feb. 6, 2018, Columbia Mayor Brian Treece announced the members of the task force tapped to organize the three-year celebration of Columbia’s bicentennial. Columbia was first founded in 1818 by the Smithton Land Company, and the new city was settled a few blocks west of Providence Road. When there wasn’t sufficient water at that location, the town was moved to the banks of the Flat Branch, renamed Columbia, Missouri, and platted in 1821. Those two dates are why the celebration will span 2018-2021. During the announcement of the members of the task force, several of those named to the planning group mentioned the group will seek to be inclusive of the entire community, by race, occupation and origin. Here is the news coverage of the event. Here are the members of the task force: Brent Gardner, chair; Pat Fowler, Historic Preservation Commission; Nate Brown, Reynolds Journalism Institute; Dr. Eryca Neville, Columbia Public Schools; Dr. Anne Deaton, University of Missouri, Chris Campbell, Boone County History & Culture Center; Tom Mendenhall, Downtown Community Improvement District; Deb Sheals, Downtown Community Improvement District; Ann Rogers. Amy Schneider, City of Columbia staff liaison. Feb. 2, 2018 — New dorm to honor Lucile Bluford’s legacy, Columbia Missourian. Summary: MU will name a residence hall for African American journalist Lucile Bluford. The atrium of the building will be named after Gus T. Ridgel, the first African American to graduate from MU. Bluford attempted to attend MU School of Journalism graduate program but was turned down due to her race. She continued to fight that decision in court until MU closed it’s journalism graduate program in 1941 after the state Supreme Court ruled in her favor according to the State Historical Society of Missouri’s website. The School said it was due to lack of enrollment due to World War II. Jan. 18, 2018 — A Blast from the Past: The Neidermeyer Apartments: A Blast from the Past: The Neidermeyer Apartments.Vox magazine of the Columbia Missourian. Summary: The Neidermeyer Apartment building was in danger of demolition in 2013, but Nakhle Asmar purchased the building and is renovating the apartment building. This article includes photographs and the history of the building from its start as the home of the Columbia Female Academy in 1837. Dec. 2, 2017 — History of the Boone County Fair, Columbia Daily Tribune. Summary: The Boone County Fair began in 1835 and was held east of Stephens College. In 1897, it was held “at the end of Fifth street, bordered by Wilkes Boulevard, Third Street, Mores Boulevard and Seventh Street.” In 1947, it was held on West Boulevard. Nov. 27, 2017 — The Neidermeyer Experiment, Columbia Daily Tribune, Coming Up section. This free and open to the public event will feature 10 UMC artists in a pop-up show of their work. The event will be held 5-8 p. on Friday, Dec. 1, 2017 in the historic Niedermeyer Apartments at 920 Cherry St.
Oct. 26, 2017 — Plotting out a century of changes, Columbia Missourian. Summary: A map of MU from 1914-1915 when MU had 3,839 students versus its current enrollment of 30,000. Highlights what’s still there and what’s missing including where MU Health is now. The coverage includes a map from 1914. Oct. 18, 2017 — Legendary history: Sharp End’s impact on the black community honored with a plaque. Summary: Coverage written by Jonathan Mitchell and Aviva Okeson-Haberman describes an event unveiling a commemorative plaque, “on the west side of Providence Road between Switzler and Pendleton streets…” Chairman of the Sharp End Heritage Committee James Whitt noted the importance of remembering history. The plaque marks the Third Street Market, which was one of the few places blacks could buy groceries, the Harvey House and the Blue & White Cafe. Oct. 17, 2017 — New historical marker commemorates three Sharp End District businesses, Columbia Daily Tribune. Summary: Three businesses that once operated in the Sharp End District were honored with a marker at 400 N. Providence along with marking a new African American Heritage Trail. The three businesses were Third Street Market, Blue & White Cafe and the Harvey House. The Sharp End Heritage Committee and community members were on hand including Vicki Russell, Loreli Wilson, manager of diversity and inclusion at Veterans United Home Loans. Oct. 17, 2017 — Mayor will appoint task force for bicentennial planning, Columbia Missourian. Mayor Brian Treece is appointing a task force to plan Columbia’s upcoming bicentennial. He proposes including many groups in the planning for events from 2018-2021. He said the task force and planning should include African American organizations and the contributions of African Americans in the founding of Columbia. Oct. 3, 2017 — West Ash, North Central neighbors make effort to downzone property, Columbia Daily Tribune. Summary: Residents of the West Ash Neighborhood want to have their area rezoned to R1, which only allows single-family dwellings. It is now mostly zoned R2, which allows two-family dwellings. The article includes information from Zandra de Araujo and residents as well as from Pat Fowler, a member of the Columbia Historic Preservation Commission. Oct. 4, 2017 — ‘Upcycle’ event planned for salvage sale. Summary: The Columbia Historic Preservation Commission tentatively set Nov. 4 and 5 as the dates for selling salvage from demolished buildings. Items likely for sale will include radiators, cattle gates, rows of seats and barn wood. Last year’s event was held in Rock Quarry Park at Rock Quarry Park, 2002 Grindstone Parkway. Aug. 26, 2017 — Columbia’s Civil War past lives on, Columbia Tribune. Summary: A school known as Lee Expressive Arts Elementary was originally named for Robert E. Lee, a Confederate general during the Civil War. This article by Megan Favignano quotes Traci Wilson-Kleekamp of Race Matters, Friends, saying she’d like people to consider what history is being memorialized, adding it’s often the history of white slave owners being memorialized. The community activist revives the century-old story of a biscuit baker who made a fortune while defying expectations, Vox magazine in the Columbia Missourian. Summary: This article by Jared Kaufman outlines the life and success of Annie Fisher and other black historical figures including Tom Bass, Henry Kirklin and Josephine Silone Yates. The article notes that Fisher was known for her beaten biscuits and that she owned 18 houses as well as ran a catering business. Note there 2009 is a book about Tom Bass, Whisper on the Wind: The Story of Tom Bass. Aug. 24, 2017 — Historic Preservation Commission hopes exploring Columbia’s history will bring neighborhoods together, Columbia Missourian. Summary: The city’s Historic Preservation Commission plans to recognize the 100-year-old Daniel Boone Tavern, 811 E. Walnut St. The commission submitted a budget of $26,000 to cover four main projects: legislative changes to help promote historic preservation, neighborhood surveys, promote historic structures and planning for centennial and bicentennial program and salvage assistance. August 2017 — Williams Hall, Columbia Business Times. 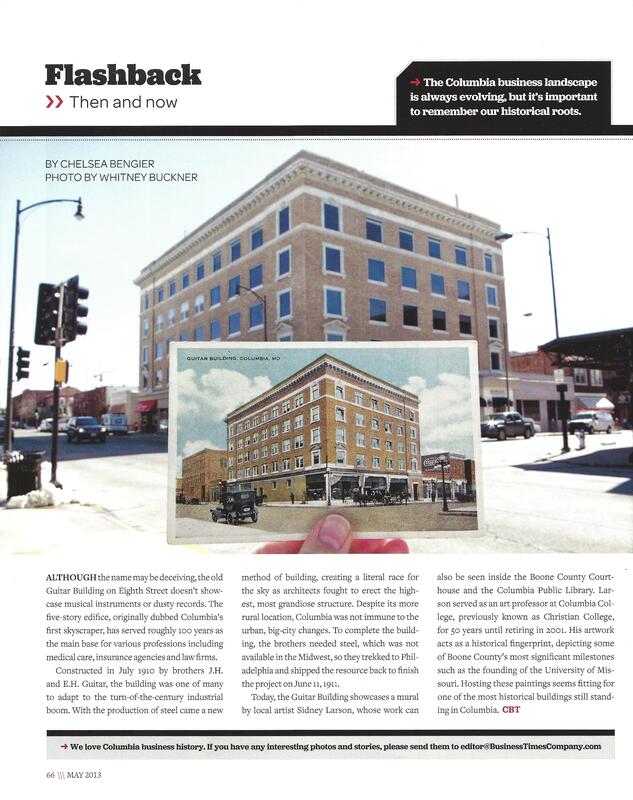 Summary: This Flashback article and photograph by Rachel Thomas highlights the 1851 building at Columbia College. It started life as an unfinished mansion of James Bennett. July 24, 2017 — Plaques unveiled, Columbia Missourian. June 14, 2017 — The Gathering Place will close in December due to budget cuts at MU, Columbia Missourian. Summary: The bed and breakfast at 606 S. College will be closed by MU. It has been operating since 1996. It has been owned by the College of Agriculture, Food and Natural Resources since 2008. The article states that MU expects to save $150,000 per year by closing the bed and breakfast, which was to have provided experience for MU hospitality students. The article cites the bed and breakfast’s website as stating that the house was built by Cora Davenport in 1906 and has been used as a fraternity house for Lambda Chi Alpha, Alpha Gamma Rho, Tau Kappa Epsilon and Sigma Tau Gamma. May 30, 2017 — The Conley House, Columbia Business Times, Flashback. Summary: Contrasting a postcard image with a present-day photograph, the article states the house was built in 1869, listed on the National Register of Historic Places in 1973. It states he lived there with his wife and four sons. Note, the couple had five children including one daughter Helen Singleton Conley. May 30, 2017 — Historical figures share their stories at Columbia Cemetery, Columbia Missourian. Summary: Event coverage of Memorial Day event sponsored by Columbia Cemetery Association Board. The event featured monologs given by actors portraying J. W. “Blind” Boone, Jane Froman, Ann Hawkins Gentry, George Swallow, John Lathrop, Luella St. Clair Moss, James S. Rollins and Walter Williams. May 30, 2017 – Video of Historical figures share their stories at Columbia Cemetary, Columbia Missourian. May 30, 2017 — Local history comes to life, Columbia Daily Tribune. Summary: Event coverage of Memorial Day event sponsored by Columbia Cemetery Association Board. The event featured monologs given by actors portraying J. W. “Blind” Boone, Jane Froman, Ann Hawkins Gentry, George Swallow, John Lathrop, Luella St. Clair Moss, James S. Rollins and Walter Williams. May 27, 2017 — The Final Ticket: Lucy’s Corner Cafe closes its doors, Columbia Daily Tribune. Summary: Cafe at 522 E. Broadway to close after 13 years under Lucy Reddick’s ownership. Includes some history of the location. May 26-27, 2017 — Lucy’s Corner Cafe to locks its doors after 30 years, Columbia Missourian. Walter Williams, founder of the MU School of Journalism and MU president from 1931-1935. April 29, 2017 — East Campus Bed & Breakfast, Columbia Daily Tribune. Summary: The home at 1315 University Ave., is again a bed and breakfast. This article outlines a grand opening. Joy Piazza is operating the bed and breakfast. It had operated as the University Avenue Bed and Breakfast for 21 years prior to closings in December of 2016. April 25, 2017 —More’s Lake might return to its former glory after years of sitting filled with ash, Columbia Missourian. Summary: A lake once used for water to cool the power plant and then used as a place to dump ash from when the Columbia Municipal Power Plant burned coal has been drained. Due to environmental concerns and regulations, the ash will be removed and taken to the landfill. The lake was created in the late 1800s by Elawson Carry More. It was once used as community fishing and recreation area. Hopes were expressed that might be again. The piece includes this link to a historical document about Columbia’s power and water developments. April 3, 2017 — City sets date for More’s Lake project public hearing, ABC17News.com. Summary: Public hearing about a contract to remove ash from More’s Lake. April 2-3, 2017 — Holding on to pieces of the past, Columbia Missourian. Summary: Discusses salvage effort on The Bull Pen Cafe, 2310 Business Loop 70 E Columbia, MO 65201. The article quotes former owner Jackie Cockrell and Pat Fowler of the Historic Preservation Commission. The Bull Pen Cafe opened in 1951. On this date, the building is owned by Marty Riback, who plans to demolish the building. March 29, 2017 — A rich past, a hazy future, Columbia Missourian. Summary: Article about the house at 216 S. Fifth St., in the shadow of student housing being built. Includes some history of the house and former resident Brian Matney, and owners of the property Adam Dushoff, Jeremy Brown and Matt Jenn. March 28, 2017 — Old Coca-Cola plant, former Varsity Theatre take Cornerstones honors, Columbia Missourian. A new program called Cornerstones of Columbia is being launched by Brent Gardner. The first two buildings to be honored are 17 N. Ninth St., which now houses The Blue Note, and 10 Hitt St., which now houses Ragtag Cinema, Uprise Bakery and Hitt Records. Nov. 3, 2017 — City of Columbia video of the 2017 Most Notable Properties. March 6, 2017 — Columbia’s most notable properties will be announced Tuesday/Unique properties await recognition, Columbia Missourian. Summary: The nominees for Columbia’s Most Notable Properties list included: 401 West Blvd., S.; 1415 University Ave., the former Phi Mu sorority house, 1506 University Ave., 1619 University Ave.; 1508 Ross St., the former home of Arthur and Annette Case. Annette helped to found the Columbia Art League and was one of the first women graduates of the Kansas State University Chemistry and Genetics Department, and Arthur helped found MU’s Dept. of Veterinary Medicine; 1003 Sunset Drive, former home of La La and Bernard Dean Walters, influential Columbia residents, and the house has a wooden floor made from leftovers from the old Columbia Propeller factory; 823 Crestland Ave., a house nicknamed the “Backward House,” because the front porch faces the backyard; and 17 and 19 on N. 5th St., the only remaining buildings from historic Sharp End African-American business district. March 5, 2017 — Concert to show off beauty of what organ is, could be, Columbia Tribune. Summary: Firestone-Baars Chapel organ performance meant to highlight the qualities of the 1950s Aeolian-Skinner organ. The organ needs $190,000 in renovations. The concert was by Haig Mardirosian. Firestone-Baars Chapel is on the campus of Stephens College. Feb. 20, 2017, Bond puts Mid-Missouri mansion on the market, Columbia Tribune: Summary: The home of former Sen. Kit Bond in Moberly, Missouri, is on the market. It was built in the 1930s by A.P. Green. A.P. Green “incorporated AP. Green Fire Brick Co. in 1915,” the article states. The company is now part of Harbison Walker International. Winter 2016 — Digital Modernism, Preservation magazine. This article is about the Miller House in Columbus, Indiana. It was a collaboration of architect Eero Saarinen, who designed the Firestone-Baars Chapel, and “interior designer Alexander Girad, and landscape architect Dan Kiley,” according to this article. Take a peek to see if you can find a resemblance. Nov. 10, 2016 — Board of Adjustment OKs repurposing Koonse Glass building, Columbia Missourian. Summary: The building at 300 N. Tenth St. (Park Avenue and Tenth Street), was given a variance on set-back requirements for the creation of a new entrance. The building is now owned by John Ott. It formerly housed Koonse Glass, a company founded in 1967, according to this article in the Columbia Business Times. Nov. 3, 2016 — City officials delay zoning overhaul, ponder extension of student housing freeze, Columbia Tribune. Oct. 14, 2016 — Slowdown in nominations puts city notable property recognitions at risk, Columbia Missourian. Summary: Only one nomination to the Columbia Historic Preservation Commission has been received and there are only 50 more days to nominate properties. The deadline has been moved back to Nov. 25, 2016. Sept. 29, 2016 — Take a tour of ragtime pianist “Blind” Boone’s house, Columbia Missourian, Vox magazine. Summary: The artifacts inside the home of John William “Blind” Boone at 401 N. Fourth St.
Sept. 29, 2016 — Racial conflict resurfaces at MU, Columbia Missourian. Summary: MU’s Legion of Black Collegians were harassed with racial slurs at the MU fraternity Delta Upsilon. Sept. 15, 2016 — Dedication, grand opening of J.W. “Blind” Boone Home scheduled Sept. 18, City of Columbia news release. Sept. 15, 2016 — ‘Blind’ Boone piano front and center in dedication of pianist’s home, Columbia Missourian. Summary: Explains J.W. “Blind” Boone, history of him, his home and grand opening on Sept. 18. Sept. 11, 2016 — Pieces of Columbia history will get new life in homes, businesses, Columbia Tribune. Summary: A sale of items salvaged by Columbia’s Historic Preservation Commission from buildings demolished. ‘Blind’ Boone’s legacy to be recognized Sunday at grand opening of renovated home, Columbia Tribune. Summary: The 16-year renovation project, Boone’s life and other black history outlined. Sept. 9, 2016 —Bits and pieces of Columbia history go up for sale, Columbia Missourian. Summary: More than 100 doors and other items removed from historic buildings that have been destroyed will be on sale from 11 a.m. to 3 p.m. Sept. 10 and 11 at the storage barn in Rock Quarry Park, 2002 Grindstone Parkway. Sept. 8, 2016 — Historic city artifacts available during weekend sale, Columbia Daily Tribune. Summary: Items removed from James Apartments and other buildings prior to being razed will be on sale from 11 a.m. to 3 p.m. Sept. 10 and 11. Also workshops will be held on Sept. 10, 2016. Sept. 6, 2016 — Service set in stone, Columbia Daily Tribune. Summary: A historical marker has been placed to highlight the graves of the local men who served in the 68th U.S. Colored Troops Infantry. This article recounts where and how they served. According to this article, 459 black men from Boone County, Missouri, served in the Union Army. Aug. 26, 2016 — A Fresh Memory of Sharp End, Columbia Business Times. This article by Brandon Hoops includes historic photos and the insights of Jim Whitt, Ed Tibbs, Lorenzo Lawson, Bill Thompson and Georgia Porter. Aug. 24, 2016 — Columbia Downtown Leadership Council favors escalating fees for street, sidewalk closures. Columbia Missourian. Summary: Struggle to manage downtown apartment development continues. Aug. 11, 2016 — Historical survey to be conducted for North-Central neighborhood. Columbia Missourian. Summary: The area bordered by Rogers Street, College Avenue, Ash Street, Walnut Street and Park Avenue will be surveyed. Information sheets will be created about the more than 220 structures in the area. Aug. 9, 2016 — City to document history of North Central neighborhood. Columbia Daily Tribune. Summary: A surveyor will be hired to document an 85-acre area by May 26, 2017. The $20,000 project is funded from a Missouri Dept. of Natural Resources grant and $8,000 in city funds. July 28, 2016 — Historic East Campus house demolished for new apartment building, this article outlines the demolition of the William T. Bayless house at 1316 Bass Ave. The house, the article notes was 100 years old and Bayless was a treasurer of Stephens College from 1905-1926. July 27, 2016 — Crews work to remove rubble after Victorian-style house demolished, Columbia Missourian. Summary: Houses at 1312 and 1316 Bass Ave. were razed to make way for a 16-unit apartment building in the East Campus neighborhood. June 17, 2016 — Renovations begin at Douglass High, Columbia Daily Tribune. Summary: The 100-year-old school at 310 N. Providence Road is under going $6.1 million in renovations. The work should be completed by August 2017. May 23, 2016 — Construction of Hagan school in central Columbia delayed for second time, Columbia Daily Tribune. Summary: Despite the demolition of a house at 1404 E. Broadway and Stephens College’s Hillcrest Hall in 2013, this college preparatory academy has still not been built. May 13, 2016 — Developer plans restaurant space at former Koonse Glass building, Columbia Tribune. Summary: John Ott plans to turn the building at 300 N. Tenth St., formerly occupied by Koonse Glass into a building with a cafe, art gallery or retail space. May 6, 2016 — Developer seeks to demolish historic East Campus houses, Columbia Missourian. Summary: Two Victorian houses, 1312 Bass Ave., and 1316 Bass Ave., have had demolition permits applied for, according to this May 6, 2016 article in the Columbia Missourian. April 19, 2016 — Plaque to mark site of last public lynching in Columbia, Missouri, Associated Press. Summary: Outlines forthcoming plaque to mark the death of James Scott, a victim of Columbia’s last public lynching. April 7, 2016 —Second Missionary Baptist Church reflects o 150 years of rich history, Vox magazine of the Columbia Missourian. Summary: History of the church at Fourth and Broadway. March 19, 2016 — Group begins salvage of historic downtown building, Columbia Tribune. Summary: 121 S. Tenth St., salvage project headed up by Pat Fowler of the Historic Preservation Commission. March 17, 2016 — Preserving Maplewood: Original family furnishings add to the historical appeal, Columbia Missourian. Summary: Two story Lenoir house undergoing $182,400 in renovations, with the funds coming from the city of Columbia and the U.S. Dept. of Interior’s Historic Preservation Fund Grant. The house is 139 years old, it was built by Slater Ensor Lenoir and wife Margaret Bradford Lenoir. It was occupied by Lavinia Lenoir, their daughter, and her husband Frank G. Nifong. March 2, 2016 — Law student starts petition to preserve historic downtown, The Maneater. Summary: Grace Shemwell, a second-year MU law student started a petition to save the James Condominium, the former Winn Hotel, at 121 S. Tenth St. While the petition with 2,636 signatures can’t save this building set for demolition, she plans to work with city officials to create zoning to protect historic buildings and incentivize affordable student housing. to March 2, 2016 — Preservations scour hotel, apartment buildings for historic gems, Columbia Missourian. Summary: Efforts to remove features from the James Condominium or Winn Hotel at 121 S. Tenth St., prior to demolition set for later in March 2016. March 2, 2016 — Group surveys historic downtown hotel before demolition, Columbia Daily Tribune. Summary: Documentation of items in and to be removed from the James Condominium or Winn Hotel at 121 S. Tenth St.
Feb. 16, 2016 — City Council approves replatting for Rise Apartments. Source: Columbia Missourian. Replatted the area on Tenth Street where James Apartments would eventually be demolished. Feb. 16, 2016 — Let them rise, Columbia Missourian. Summary: Why and how the James Apartments at 121 S. Tenth St., and several other buildings will be demolished. Dec. 8, 2015 — Historic preservation, Columbia Daily Tribune. Summary: An opinion piece from the publisher of the Columbia Daily Tribune, Henry J. “Hank” Waters III on the City Council’s possible approaches to slowing the demolition of historic properties downtown. Dec. 5, 2015 — Commission to ask city council for historic building protection, Columbia Daily Tribune. Summary: Historic Preservation Commission will ask city council to approve ways to help preserve historic buildings. Nov. 8, 2015 — Ceremony celebrates black Union veteran, Columbia Daily Tribune. Civil war veteran receives cemetery marker. Nov. 8, 2015 — Architecture tour helps Columbia residents brush up on vocabulary, Columbia Missourian. Summary: Columbia’s Historic Preservation Commission took a walking tour to highlight architectural items and terms. Nov. 3, 2015 — Historic Preservation Commission to host architectural walking tour, Columbia Missourian. Summary: Sara Loe, of the HPC, will guide a tour to look at architectural elements including fenestration, quoin, transom. Oct. 23, 2015 — Historic Preservation Commission hosts spooky walking tour — Columbia Missourian. Oct. 7, 2015 — City leaders finalizing new historic marker program — Columbia Daily Tribune. Summary: Brent Gardner, a former member of the city’s Historic Preservation Commission, is heading up a yet to be named program to put up historical markers with educational information on buildings. The first two markers were to be funded by the Central Bank of Boone County. The cost was estimated at $1,000 per marker. Sept. 21, 2015 — Locals tour downtown Columbia to learn about history. Columbia Missourian. May 20, 2015 — Sharp End, the 1950s, Columbia Daily Tribune. Summary: Outlines the area called Sharp End, a black business and residential area of Columbia destroyed during urban renewal in the 1950s-1960s. May 20, 2015 — A Sharp reminder, Columbia Daily Tribune. Summary: Describes “Sharp End,” a black business area of Walnut Street between Fifth and Sixth streets. Quotes Larry Monroe, Patrick Tapp among others. It covers the dedication attended by more than 200 people. Also cites Sharp End Heritage Committee. May 17, 2015 — Sharp End dedication caps work to recognize black business district, Columbia Daily Tribune. Summary: A marker will be unveiled to highlight Sharp End, the black business and residential district, in Columbia, Missouri. May 12, 2015 — Memory Lane: Commission honors notable properties, Columbia Daily Tribune. Summary: Columbia Historic Commission names properties to notable properties list. The properties include the Hubble Place Addition, 213 S. Glenwood Ave. and the Frederick Apartment building. May 11, 2015 — Historic Preservation recognizes Hubbell Drive’s 1920s bungalows, Columbia Missourian. Summary: HPC honors Hugo and Lucy Vianello for preserving the Missouri Theatre. May 1, 2015 — Boone County National Bank changing its name, Columbia Daily Tribune. Summary: The new name will be Central Bank of Boone County. The bank was founded in 1859 by Moss Prewitt, Robert B. Price and John Parker as a branch of Exchange Bank. April 2015 — Flashback, Guitar Building, 22 N. Eighth St., Columbia Business Times. Guitar Building, 22 N. Eighth St., historic image and present image, highlighted in an article the April 2015 edition of the Columbia Business Times, used with permission. Jan. 14, 2015 — “Blind” Boone focus of artistic performance at diversity celebration. Columbia Missourian. November 2014 — Flashback: 720 E. Broadway, Columbia Business Times: Summary: In 2014, the bank at this address was Boone County National Bank. In 2015, it changed its name to Central Bank of Boone County. The bank began in 1857 with Moss Prewitt and his son-in-law R.B. Price and it was named Prewitt and Price. In 1863, it was named First National Bank of Columbia and in 1871 it was named Boone County National Bank, according to the November 2014 Columbia Business Times article. It was also the bank with Columbia’s first ATM in 1977. The third floor was added in 1986 and the fourth floor was added in 1991. The building’s first floor was renovated in 2012. July 11, 2014 —Historic Preservation Commission organizes downtown walking tours – Columbia Daily Tribune. The Historic Preservation Commission will hold free, historic tours at 7:30 p.m. on July 31, 2014, August 14, 2014, Sept. 18, 2014 and Oct. 30, 2014. Tours will meet at the City Hall “key,” on Broadway and Eighth Street. July 10, 2014 — Richard King sells The Blue Note, Mojo’s — Columbia Daily Tribune. July 9, 2014 — Richard King passes torch, sells The Blue Note, Mojo’s — Columbia Missouri. July 2014 — The Battle For Stewart Park — Inside Columbia magazine. Summary: History of Stewart Park and a bit about John Stewart. June 17, 2014 — Aviation sign uncovered at Columbia demolition site — Summary: A sign, “Stephens College Aviation Department,” was found during city demolition of a building at Cosmos Park. Stephens College had an aviation department at the then Columbia Municipal Airport from 1941 until 1960. Stephens College Scene. June 5, 2014 — More ‘historic’ Columbia properties demolished in 2013 — Summary: Numbers of demolitions of historic buildings increase: 60 in 2013, 43 in 2012, 34 in 2011. Columbia Daily Tribune. April 27, 2014 — Mural project unites neighborhood — Summary: The Heibel-March building is now home to Grove Construction and volunteers finally finished a mural began in 2007, a project that faltered when the renovation of the 1910 building seemed to be at a standstill. Columbia Tribune. April 2, 2014 — Former Fairview church among Most Notable Property honorees — Highlights the former church that now houses Countryside Nursery School, and notes Chapel Hill used to be the southern portion of West Boulevard, but was renamed due to its proximity to the church, which also gave its name to Fairview Road. April 2, 2014 — Historic properties celebrated at 15th annual Most Notable event — This article by Andrew Denney Outlines a few facts for each of the five properties named to the Most Notable properties list by Columbia’s Historic Preservation Commission. The properties are: Fairview United Methodist Church at 1320 S. Fairview Road., Fairview Cemetery at Chapel Hill and Fairview Road, Francis Pike House at 1502 Anthony St., Bess and Dr. J.E. Thornton House at 905 S. Providence Road. March 31, 2014 — City gets state grant to conduct historic preservation seminars — Workshops will be held for residents to learn about how to renovate their homes, including windows, paint and flooring. The workshops are funded by a Missouri Department of Natural Resources grant giving to the City of Columbia’s Historic Preservation Commission. March 25, 2014 — Auditor says Missouri historic tax credits program too expensive — Missouri State Auditor Tom Schweich says less than half the of the $1.1 billion spent on historic tax credits is spent on projects. The rest is used when developers sell the credits to individuals or companies that use them to reduce their tax liability. Columbia Tribune. March 17, 2014 — Columbia City Council agrees to fix brick roads, add more — Discusses approval of city agreement to uncover and restore brick streets. Includes link to information noting the cost of uncovering brick streets at about $100,000 per city block. March 16, 2014 — Columbia City Council to vote on brick street — Outlines reasons and costs for uncovering, replacing Columbia’s brick streets. Notes asphalt streets last about 15 years, brick streets about 100. Notes brick streets are deteriorating because of poor foundations. March 7, 2014 — Blind pianists’ duel was a sight to behold — Discusses the background of the “Blind Tom” Wiggins and J.W. “Blind” Boone historic piano duel, which was re-enacted on March 3, 2014 on Boone’s 1891 Chickering Grand at the Boone County Historical Society. March 6, 2014 — Heibel-March Building to open after 16 years of vacancy. March 5, 2014 — “The Battle of the Keys,” outlines the historic concert competition between J.W. “Blind” Boone and “Blind Tom” Wiggins. Boone’s former home is at 10 N. Fourth St.
Feb. 20, 2014 — City plans to complete interior restoration of ‘Blind’ Boone home this year. Columbia Tribune. The home of J.W. “Blind” Boone, a famous pianist, still needs interior restoration, which the City of Columbia plans to do. Feb. 10, 2013 — If walls could talk — The history of the Niedermeyer Apartment building. Columbia Daily Tribune. Sept. 13, 2013 — Safeguarding History, CAFNR News. Summary: This article outlines what has happened to the Guitar house, 2815 Oakland Gravel Road, since CAFNR employee Pat Westhoff and his wife Elena Vega bought the house. The house has apparently been wrongly referred to as Confederate Hill. The article includes excellent photos and information outlining evidence refuting David Guitar’s alleged service in the Confederate forces. The evidence includes this obituary published on Jan. 2, 1912 in the newspaper, the University Missourian. June 25, 2013 — Old Stephens buildings to make way for academy soon. Columbia Daily Tribune: Summary: Demolition of Stephens’ Hillcrest Hall, two houses on Dorsey and at house 1404 E. Broadway, will be demolished to make way for the Hagan Scholarship Academy, a place planned as a college preparatory school for students from rural areas. June 13, 2013 — In Student Housing, Luxuries Overshadow Studying, NYTimes. Summary: An article looking at the downtown student housing boom, with a comment expressing concern about the area being overbuilt, another statement about too many luxuries at the new housing, and one comment calling the new apartments “soulless” compared to the Niedermeyer Apartments. June 2013 — The Hansel and Gretel House — There’s more to this home at 121 West Blvd North than meets the eye. April 14, 2013 — Pianists house is an asset; City’s black history bigger than Boone — Author Doug Hunt argues in this opinion piece that the J.W. “Blind” Boone home at 10 N. Fourth St., should be saved to mark Boone’s success despite obstacles. March 30, 2013 — Candidates give thoughts on “Blind” Boone home — Candidates for Columbia City Council and mayor offer opinions on whether the city should fund the completion of the renovation of the home of J.W. “Blind” Boone at 10 N. Fourth Street. The exterior of the house has been renovated, but inside requires roughly $500,000 in improvements. Columbia Daily Tribune. March 28, 2013 — Missing Mansions. Some historic buildings escape the wrecking ball. Others aren’t so lucky — This article lists and describes six mansions that were razed in the past, including the home of Union General Odon Guitar and the 1843 home of J.L. Stephens, the namesake of Stephens College. Vox Magazine. March 19, 2013 – Council questions Blind Boone home expenditure – A proposal by Columbia City Manager Mike Matthes to spend $475,000 of a city surplus to finish the restoration of the J.W. “Blind” Boone Home was strongly debated at a City Council meeting. March 13, 2013 – Buyer plans to start with basic fixes – Nakhle Asmar, who recently purchased the 1837 Niedermeyer, outlines his plans to update and repair the Niedermeyer. Columbia Daily Tribune. Feb. 20, 2013 — City surplus might fund Boone home restoration — Columbia Tribune. Columbia Mayor Bob McDavid proposed spending $500,000 of a city surplus of $1.9 million to finish restoration of the J.W. “Blind” Boone home at 10 N. Fourth Street. Feb. 5, 2013 — Columbia’s 2013 Most Notable Properties — Properties named to Columbia Most Notable Properties list, including the Niedermeyer Apartments at 920 Cherry St. Columbia Missourian. Dec. 11, 2012 — Students, officials at Stephens College react to property sales — Columbia Missourian. Summary: Hillcrest Hall and Stephens Auditorium to be demolished to make way for Hagan Scholarship Academy. October 29, 2012 — Radiation continues to impact MU (Pickard Hall) building — An update on the radiation contamination of Packard Hall, an 1892 building at the University of Missouri. Oct. 4, 2012, Slave cabins in Boone County, Vox Magazine. This article outlines the characteristics of slave cabins and the importance of preserving them. Sept. 22, 2012 — Panel working on new demolition, historic preservation rules — The city’s Historic Preservation Commission proposes changes to rules for demotion, considering a longer waiting period. The pondered changes follow the demolition of the ca. 1920 Annie Fisher house, once owned by a former slave who was one of Columbia’s first African-American business owners. Sept. 16, 2012 — Preservation study’s author not unbiased. This letter to the editor by David Stokes, a policy analyst at the Show-Me Institute, describes research report by Development Strategies as bogus. Development Strategies conducted research on the economic results of historic preservation. Columbia Tribune. Sept. 4, 2012 — Study looks at economic effects of historic preservation. A decade of historic preservation tallied up more than $1 billion in direct and indirect economic activity according to a report by Development Strategies, in research contracted for by the Columbia Historic Preservation Commission. Columbia Tribune. Feb. 20, 2012 — Owner says renovated Tiger Hotel will be ready for True/False guests — The re-opening of this hotel has been delayed, but developer Gly Laverick of Columbia Hotel Investments says it will be ready for the documentary film festival, True/False. Columbia Missourian. Feb. 6, 2012 — New historic sites include motel, college hall. Columbia College hall, late-’30s motel on list. Columbia Tribune — The motel on Business Loop 70 is named to the 2012 Most Notable Properties. Jan. 3, 2012 — New owner turns historic Guitar Mansion into graceful home again. See the house as it gets a needed spruce up at this link to a Jan. 3, 2012 Columbia Missourian article. Jan. 3, 2012, New owner turns historic Guitar Mansion into graceful home again, Columbia Missourian. This article outlines how the house at 2815 Oakland Gravel Road is seeing new life as a single-family home once again and getting a well-deserved spruce up. Nov. 29, 2011 — Annie Fisher house torn down — Columbia Daily Tribune. The Annie Fisher house at 2911 Old Highway 63 South was demolished. Nov. 8, 2011 — History, economics drive decisions on brick streets — Columbia Missourian. Debate on whether to pave Short Street with brick. Oct. 23, 2011 — Plans for Heibel-March building stagnate — Columbia Tribune. Building at Rangeline and Wilkes Boulevard is still awaiting renovation. Several other plans to renovate the plans have fallen through. Fall 2011 — Lighting the Way — Summary: Light lenses on store fronts and transoms provide multiplied lights. One example is at 812 E. Broadway. Missouri Resources, permission granted to use a reprint of this information. August 25, 2011 — MU set to lease, operate Missouri Theatre, Columbia Daily Tribune. Agreement made to have University of Missouri lease the theatre at 201 S. Ninth Street. August 11, 2011 — These Old Houses or Two houses preserve part of Columbia’s history. This Vox magazine article focuses on the John W. “Blind” Boone house at 10 N. Fourth St., and the Taylor House at 716 W. Broadway. The online version includes great pictures of both homes. Aug. 18, 2011 — Owners get approval to raze Annie Fisher House, Columbia Daily Tribune. June 21, 2011 — Radiation lingers in MU’s Pickard Hall, Columbia Daily Tribune. This article outlines the issue of radiation in Pickard Hall, the result of Professor Herman Schlundt work on extracting radioactive materials from natural ores. Feb. 15, 2011, Historic Preservation Commission to celebrate five notable properties, Columbia Missourian. Outlines the five properties named to the Columbia Most Notable Properties List. The article includes photographs, a slide show and a map. Feb. 15, 2011, Columbia Historic Preservation Commission Honors Most Notable Properties, KOMU.com. Television news about the Feb. 16, 2011 event announcing the five new properties named the Columbia Historic Preservation Commission Most Notable Properties List. Notes these five are to be added to the 118 already on the list. Feb. 21, 2011, Failed projects dot history of hotels’ backer, Columbia Daily Tribune. The Tiger Hotel, a 1928 building at 23 S. Eighth St., has in the process of being renovated for five years. It is inching closer to finding a developer and investor to turn this into a boutique hotel, but this article highlights the past failures of the proposed partner. Feb. 7, 2011, President’s house, Columbia Daily Tribune. This is an editorial by Hank J. Waters III supporting the campaign to renovate the house, support which makes sense given he is a member of the campaign’s board. Here is a link to a historic article published in 1927, shortly after the home was completed. Feb. 5, 2011, Stephens College aims to restore President’s Home, Columbia Daily Tribune. Plans to restore the 1926 Stephens College President’s House. This article includes photographs and outlines the history of the home and the fund-raising campaign. Jan. 30, 2011, Missouri Theatre names new leaders…”, Columbia Daily Tribune. Carole Sue DeLaite, new co-president of the Missouri Symphony Society board, said plans for keeping the theatre open are being made. Dec. 2010 — The Arch McCard house at Ash Street and West Boulevard is up for sale. Originally a two-room log cabin, it was built in 1911 and added onto later. It has been owned by Herb and Betty Brown since 1956, and now both have died. Dec. 10, 2010 — Missouri Theatre: A history of volunteerism, Columbia Business Times. Dec. 18, 2010 — Wes Wingate staking presence on East Walnut, Columbia Daily Tribune. This article outlines the renovation of 1020 E. Walnut St., and the business, Columbia Academy of Music, that will be opened there by Wes Wingate. Dec. 30, 2010 —Historic Preservation Commission receives grant for study, Columbia Missourian. Dec. 31, 2010 —State agency OKs grant for Columbia, Columbia Daily Tribune. Preliminary approval of a $12,000 state grant to the city of Columbia to study the economic effect of historic preservation. Oct. 24, 2010 — History & haunts. Columbia Tribune. A walking tour given by the Columbia Historic Preservation Commission. Sites included Senior Hall at Stephens College and on the campus of the University of Missouri, the residence on Frances Quadrangle, Conley House , the Columns, and on Ninth Street, the Missouri Theatre. Oct. 18, 2010 — Historic Guitar Mansion sold to surprised bidder, Oct. 18, 2010, Columbia Missourian. Oct. 19, 2010 — Historic Guitar Mansion sold at auction for $155,000, Oct. 19, 2010, Columbia Daily Tribune. October 2010 — The Guitar Mansion at 2815 Oakland Gravel Road was sold to new owners at auction for $155,500. The home had been valued at $499,000, but had been vacant for several years prior to this purchase. Aug. 29, 2010 — Booches, Guitar Building rack up years downtown, about Guitar Building at 22 N. Eighth St., by Warren Dalton, Columbia Daily Tribune. July 21, 2010 — Arts community shaken by Missouri Theatre closure. Columbia Missourian. Summary: Reaction from various art community members to the upcoming August and September 2010 closure of the Missouri Theatre, now the Missouri Theatre Center for the Arts. July 21, 2010 — After closure, uncertainty hangs over Missouri Theatre’s future. Columbia Missourian. Summary: Outlines upcoming closure of Missouri Theatre, now the Missouri Theatre Center for the Arts. Includes photos of the grand reopening on May 21, 2008 with Tony Bennett and historic photos. Includes summary of theatre’s financial troubles. July 21, 2010 — Staffers on job market after long uphill journey – Columbia Daily Tribune. Summary: The Missouri Theatre, now the Missouri Theatre Center for the Arts, laid off the remaining staff members. July 21, 2010 — Future unclear as theater shuts doors. Hiatus planned until September. – Columbia Daily Tribune. Summary: The Missouri Theatre, built in 1928, was renovated in 2008 for $10 million. Now called the Missouri Theatre Center for the Arts, it still has a debt of $2.5 million and has been plagued by financial troubles. The MTCA will close in August and remain closed into September. July 13, 2010 — Historic sites will go online. – Columbia Daily Tribune. Summary: An online map is in the works which will allow anyone to go online and learn all about Columbia’s 121 Notable Properties and 33 properties and areas on the National Register of Historic Places. The project is being funded by a $3,660 grant from the Missouri Department of Natural Resources, with a $2,440 local match. Completion date is scheduled for November 2011. July 7, 2010 — Future of Missouri Theatre uncertain. Columbia Daily Tribune. Summary: Column by Bill Clark outlines the troubles the Missouri Theatre, now Missouri Theatre Center for the Arts, faces, including the CEO Eric Staley stepping down as of July 31, 2010. July 2, 2010 — Theater chief to resign after 10 months on job. Columbia Daily Tribune. Summary: Eric Staley, CEO of the Missouri Theatre, now named Missouri Theatre Center for the Arts, plans to step down as of July 31, 2010. Says he’s proud of raising $500,000 in his 10 months, and criticizes the structure of the organization. Feb. 19, 2010, Notable Properties: Historic Renovation Boosts Community Commerce, Columbia Business Times. This article outlines the commercial, economic benefits of historic renovation. Includes comments from one of the first commercial buildings to be named a Most Notable Property by the Columbia Historic Preservation Commission. The business owner, Richard King, operates The Blue Note, a thriving live music venue in an old historic theatre. The article includes a list of commercial properties on the Notable Properties List. June 25, 2010 — Capturing Columbia’s Cinema Century— Columbia Business Times. Summary: Outlines the history of movie theatres in Columbia and in the nation. Includes extensive timeline. June 23, 2010 — Upcoming ruling pivotal to Missouri Theatre’s finances, future. Columbia Missourian. Summary: Outline of the financial troubles facing the Missouri Theatre, now the Missouri Theatre Center for the Arts. The information notes the upcoming August 31 arbitration ruling on a $400,000 in dispute with Huebert Builders stemming from the 2008 $10 million restoration. March 15, 2010, State review board approves historical district on West Broadway, Columbia Missourian. Summary: The application for a West Broadway Historic District being named to the National Register of Historic Places was approved by the Missouri Advisory Council on Historic Preservation. Feb. 3, 2010 — Bricks, graves given “most notable” status. Columbia Daily Tribune. Summary: Five properties named to most notable properties list. The properties are Stephens Stables, 203 Old Highway 63, 211 Bingham Road, Berry Building at Walnut and Orr Streets, Columbia’s brick streets, Jewell Cemetery and Phi Kappa Psi Fraternity, 809 S. Providence Road. Feb. 2, 2010 – Historic Preservation Commission names 7 ‘most notable’ properties – Columbia Missourian. Jan. 13, 2010, Historical houses offer glimpse of Columbia’s past, Columbia Missourian. Summary: Application submitted for National Register of Historic Places designation for West Broadway Historic District, 300-922 Broadway, except 80, 808, 812. Aug. 15, 2009 — Apartments to fit in with Missouri Manor site — Columbia Daily Tribune. Missouri Manor Apartments LLC, Travis McGee, Tom Mendenhall, Gary Evans and Paul Humphrey, plan to add apartments and make the manor fit into it. References Tara Apartments which were built around the Rockhurst home. April 2, 2009 — New student center name debate dredges up Brady’s past, The Maneater. Summary: This article provides context to statements that Thomas Allan Brady was homophobic and racist. It reports that statements attributed to him were him quoting another person and another statement referenced the fact that in 1947 MU was legally segregated and in 1949 and during Brady’s entire lifetime, homosexuality was illegal by law in Missouri. Summer 2008 — Honoring historic homes — Mizzou, magazine of the Mizzou Alumni Association. Summary: Spotlights homes named to 2006 Columbia Notable Properties which have MU ties. These houses are 211 Westwood Ave., 509 Thilly Ave., 511 Westwood Ave., 2011 N. Country Club Drive, 2007 S. Country Club Drive. March 8, 2008 — Apartments honored for long-standing service — Columbia Missourian. Summary: The Belvedere and Beverly apartment buildings, 206 Hitt St., and 211 Hitt St., respectively and named to the Columbia Notable Properties List. 2004August 8, 2004. Visions of the past. Columbia Daily Tribune. Summary: The Guitar House (Guitar Mansion, 2815 Oakland Gravel Road) becomes a bed and breakfast under the ownership of Noel and Mary Ann Crowson. Includes photographs of the restored home, historic photos of Odon Guitar, David Guitar and graphics on the additions to the home from 1859-1940. May 5, 2004 — Group recognizes local landmarks — Columbia Historic Preservation Commission recognizes 12 properties: 202 S. Glenwood, Sigma Alpha Epsilon Fraternity House at 24 E. Stewart Road, The Heidman House at 709 Broadway, Thomas Hart Bento Elementary School at 1410 Hinkson Ave., Sally Flood house at 1620 Hinkson Ave., the house at 2 E. Stewart Road, the Keene School home at 4713 Brown Station Road, The Champlin House at 1312 W. Broadway, the Arch McHarg (not McCard as reported in this article), at 121 West Blvd., The Wabash Arms Building at 821 Walnut St.
Summer 1991 — The Lynching of James T. Scott: The Underside of a College Town, Gateway Heritage magazine, vol. 12, no. 1, Summer 1991. Copyright by the Missouri Historical Society.